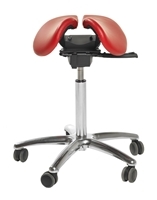 All of us at Health By Design now use a saddle-seat as our primary work chair... by choice. We are free to choose any chair we wish - and we have the best ergonomic chairs money can buy to chose from - yet, most of us prefer saddle-sitting. Why? Because we feel better and work better in a saddle. Mind you, not all of us embraced the saddle-sitting concept immediately. For some of us, the seats were uncomfortable at first, and some thought them so silly looking that they wouldn't even try them for a year or two. However, over time, the idea caught on. Some of us who have had back and neck pain for many years, in every ergonomic chair we ever tried (and we've tried hundreds!) finally found relief in the saddle. We're convince that saddle seats provide more healthful sitting postures than conventional ergonomic chair designs. Research indicates the healthiest sitting posture is on horseback. Saddle sitting automatically preserves your spinal curves even when you lean forward to work. Saddle-sitting relieves back, neck, hip, and arm pain. Saddle-sitting strengthens the spine and improves posture. Saddle sitting improves leg circulation and reduces fatigue. You cannot slump this way in a saddle seat, even if you try! A balanced and relaxed saddle stance. In a saddle seat, kids sit up straight without you yelling at them! Saddle-sitting enhances hand acuity and strength. Precision hand activity is facilitated through improved positioning of the shoulder girdle and upper back, and a more stable torso. You must raise your desk when you saddle sit. We used Raise Its in the picture below, but this worker's desk should be even higher. Notice that the desk must be higher with a saddle seat. Saddle-sitting makes it easier to get up and sit down. You sit higher than usual, so sitting down and getting up without using your hands is really easy and quick. Saddle-sitting improves mobility and reach. You can reach further and more safely on a saddle chair. Saddle-sitting preserves your spinal curves even when you bend forward. As the saddle-seat frees your legs to move, turning, moving and reaching out for things becomes quick and safe, almost gymnastic.